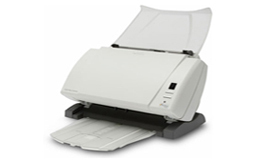 The i1320 Plus is a 60 ppm Duplex (Portrait) departmental color scanner with a 75 page Automatic Document Feeder and advanced image processing features. The i1320 Plus allows for the capture of documents in Color, Bi-tonal or Grayscale. The ADF (Automatic Document Feeder) handles a wide range of document sizes and types (including ID Cards, multiple feed) with ease. A powerful combination of performance and value, for all your departmental scanning needs Let's get right to it—the Kodak i1320 Plus Scanners deliver the highest level of capability and affordability of any product in their category. This is true breakout performance, with ease of use, versatility and image quality that sets a new benchmark. You can auto-feed virtually any document, from the size of a driver's license up to 863 mm (34 in.) long at speeds up to 60 pages per minute. Scan both sides of documents in a single pass and output images in color, bitonal or grayscale. The i1320 Plus feature 600 dpi optical resolution and enhanced Perfect Page Image Processing, a Kodak exclusive. This gives you images of exceptional quality—about as automatically as it gets. No need for rescans. When you combine our image quality, ease of use and overall performance with the peace of mind that comes with Kodak Service & Support, the i1300 Plus Series delivers truly awesome value. ADF Feeder Paper Size Min. - W x L 2.0 x 2.5 "
ADF Feeder Paper Size Max. - W x L 8.5 x 34 "
Care Kit, Group B Capture Pro Software 2 Yr.
Care Kit, Group B Capture Pro Software 3 Yr.